These polenta crostini scream TASTY at every bite. Light and refreshing, you only need a bunch of fresh ingredients to put together this simple yet elegant starter. 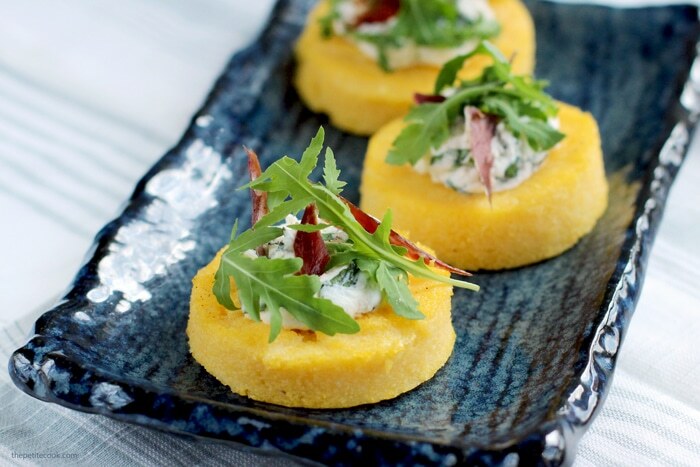 Polenta is ground cornmeal that you can boil and serve soft but you can also use to make delicious cakes, or simply grill and stir-fry. It’s a popular dish in the north of Italy, and it’s often served with bolognese sauce during the cold months of the year. 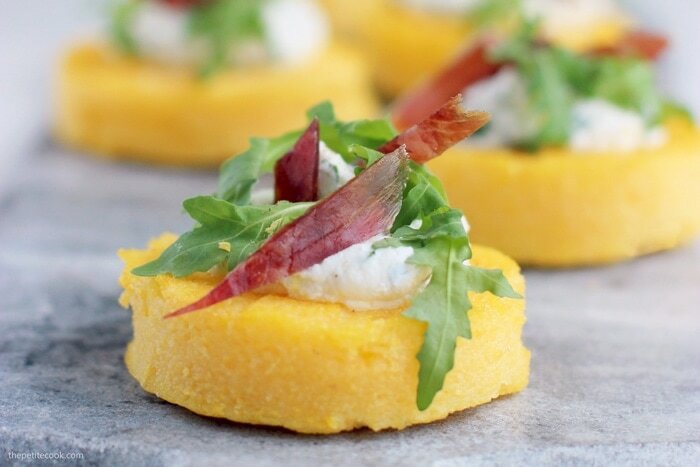 Whilst a plate of rich hot polenta warms your heart when it’s freezing outside, these light Polenta Crostini with Jamon Ricotta and Rocket make an awesome appetizer all-year-round. 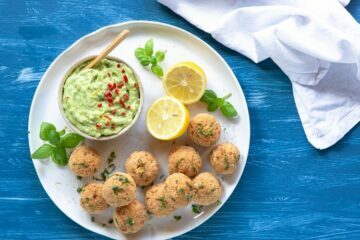 Since they’re made with cornmeal, these tasty bites are also conveniently gluten free and make a well balanced dish. 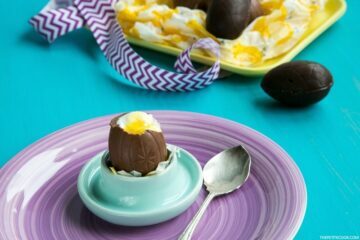 Pretty and yet simple, these flavourful bites are surely a great idea for a party, bbq or even a fancy dinner, and only require very little preparation. 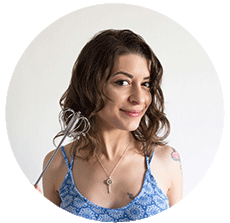 Start by cooking the polenta, most grocery stores have the partially cooked version available, which only takes 15 mins to cook. 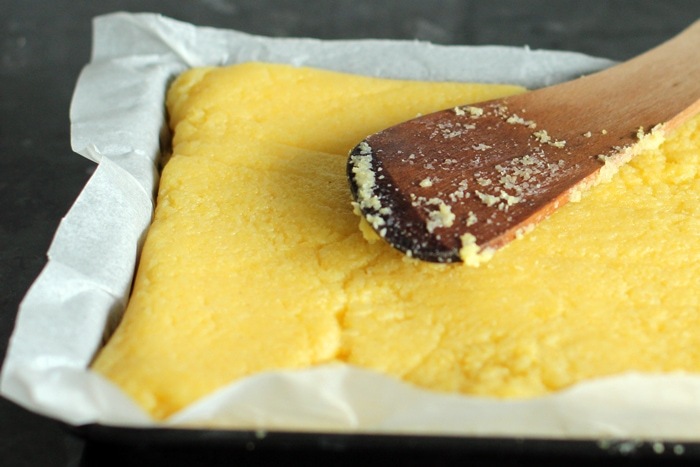 Once the thick polenta is fully cooked, spread it over a small tray covered with parchment paper. Do it while it’s hot, polenta sets very quickly and you want to level it properly to create a rectangular even shape before it hardens. Allow the polenta to cool for 10 min or so, then use a cookie cutter to cut it into small rounds. 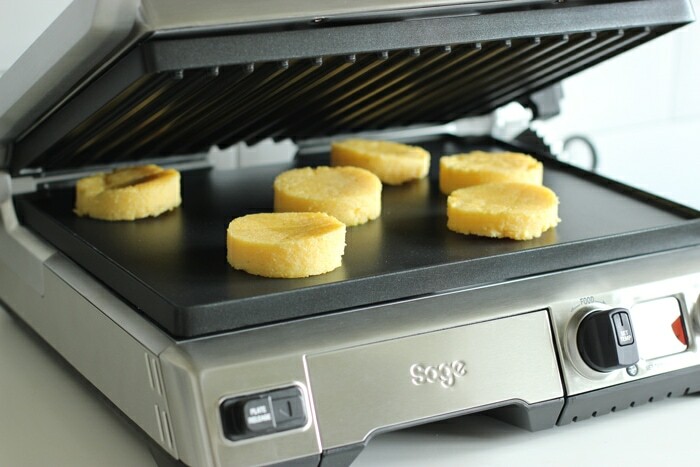 To grill your polenta crostini you can use a pan or an electric grill like I did. Two minutes on each side and they will be perfectly crispy and ready to be topped with fresh aromatic ricotta and spanish ham. The herby ricotta on top has been one of my favorite things to eat this summer. 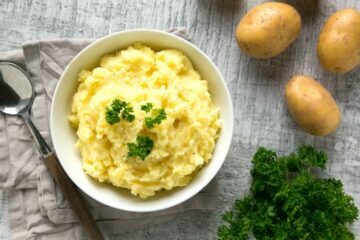 You must have noticed that I’ve used it in some of my recipes lately, I’m so impressed on how versatile and good it tastes with different food combo. I love the sweet aromatic note that adds to this dish and makes a GREAT pair with some tasty Jamón ibérico. If you don’t have the spanish ham at hand (but you should definitely try it -I’ve talked about it here), go for the italian San Daniele or your favorite cured meat. 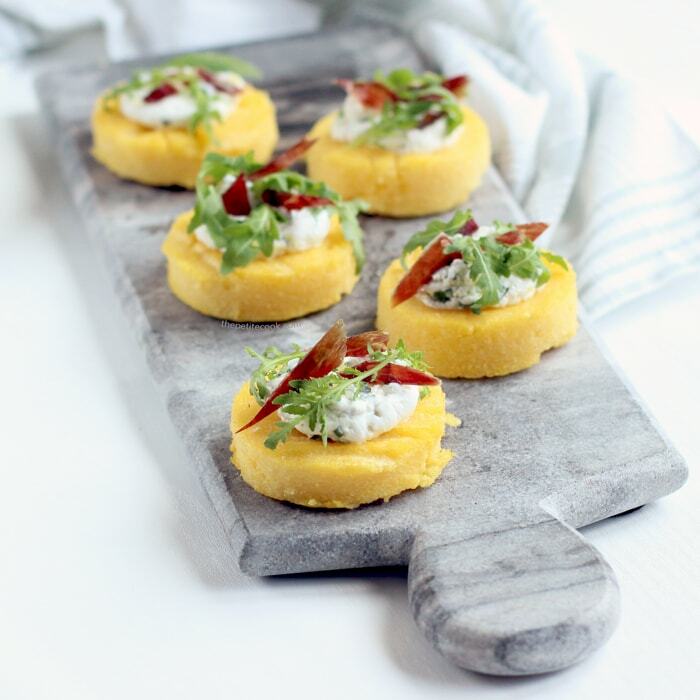 Or you can simply leave the protein out and keep the polenta crostini awesomely vegetarian. 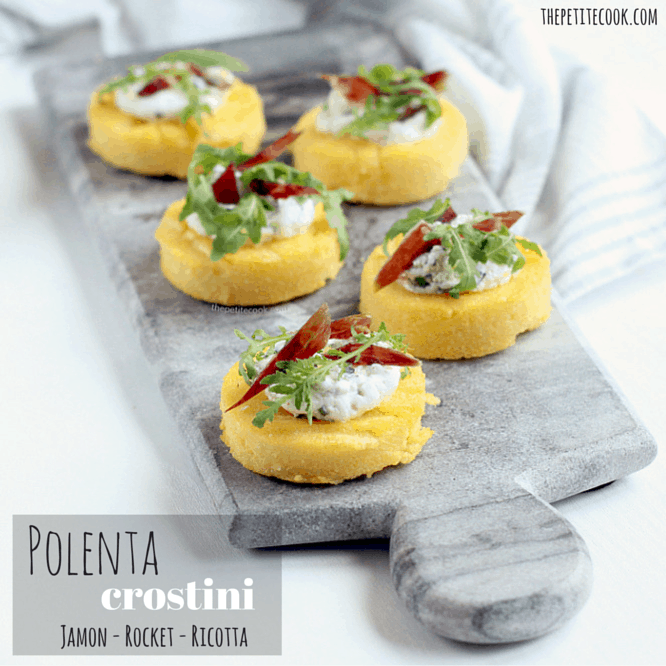 What I love the most about these light polenta crostini is that you can easily customize them to meet your taste. Have fun trying new ingredients combo, these gluten-free snack is easy to load with your favorite ingredients just like a bruschetta would be. Bring water to a boil in a large saucepan over high heat. 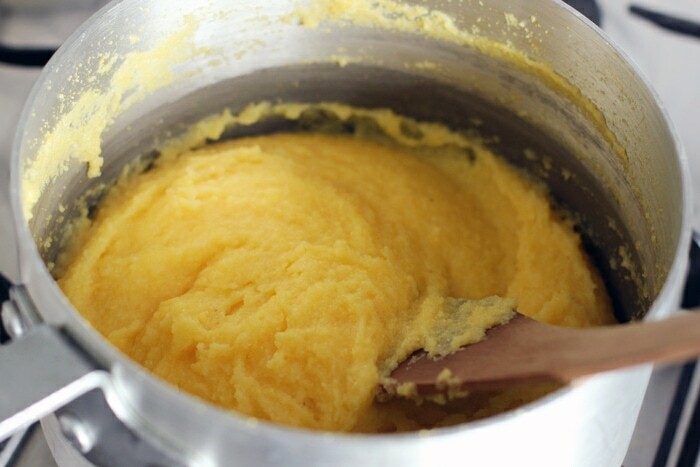 Gradually pour in the cornmeal in a thin stream, whisking continuously. Season with salt. Reduce the heat to low and stir with a wooden spoon until the mixture is very thick, about 5 minutes. Remove from the heat and spread as evenly as possible, over a tray covered with parchment paper. Cover with another sheet of parchment paper and allow to set and slightly cool. 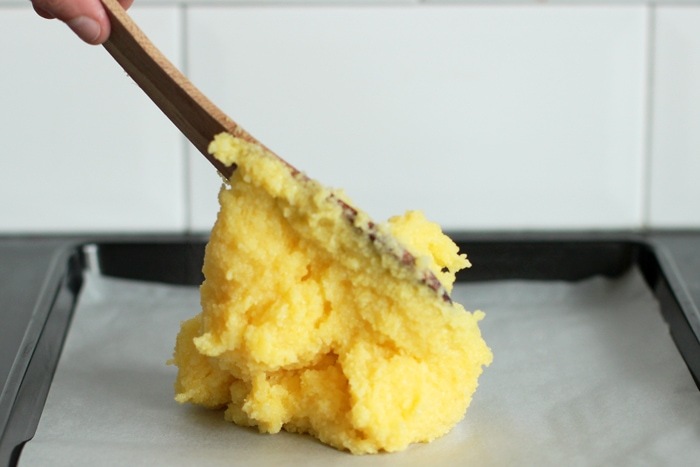 With the help of a cookie cutter, cut the polenta into rounds, brush with little olive oil and grill for 2 mins on each sides. 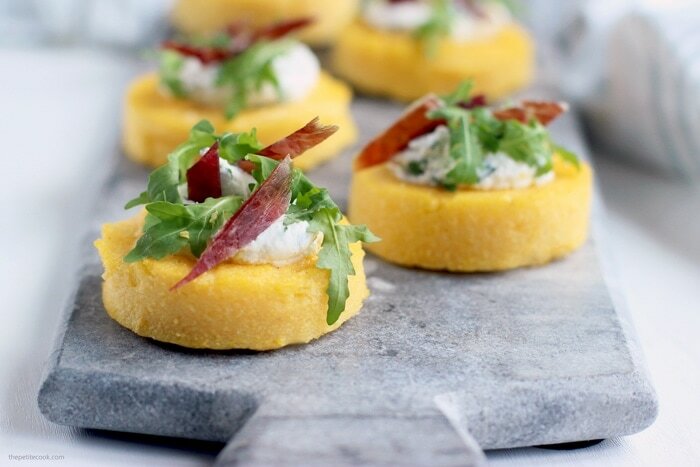 Spread some herby ricotta over the polenta crostini and decorate with arugula, iberian ham, and lemon zest. Serve immediately at room temperature or chilled. Store in the fridge in an airtight container up to 2 days.